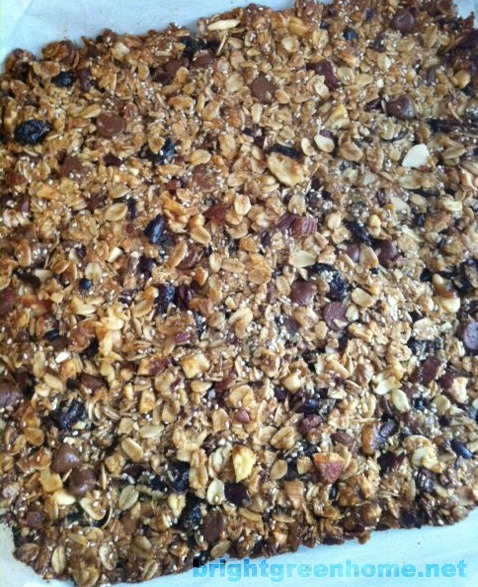 I’m a fan of granola in all forms, and I’ve even made my own loose granola in the past (Mark Bittman’s Crunchy Granola recipe from the New York Times). But my true love is chewy granola, and I’ve been searching forever for the perfect granola bar. 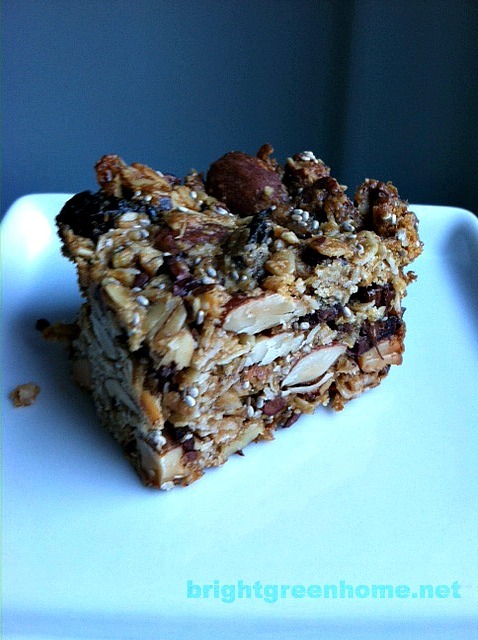 Most packaged bars are either too sweet, not hearty enough (so many puffed grains! ), or both. And I never found a recipe that looked good enough to attempt. 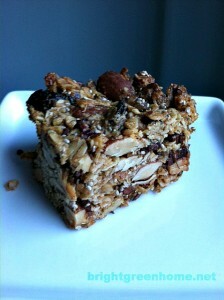 Then I found this chewy granola bar recipe on Smitten Kitchen and it was all over. (Actually, I first found another recipe that was clearly adapted from the SK version, or from the King Arthur original that inspired the SK recipe, but it didn’t credit either, so I’m not linking to it.) I’ve tweaked it a bunch and made it probably a hundred times and I can confidently say these are indeed the best granola bars ever. They are dairy-free and can easily be made gluten-free (if you use certified GF/uncontaminated oats) and/or truly vegan (if you sub maple syrup or another sticky sweetener for the honey). You can substitute the nuts and dried fruit of your choice, and change up the sweeteners. There’s still a fair amount of added sugar, which you need to make the bars cohere without getting rock hard, but I bet you could cut it a bit more and replace with nut butter. Grease a 9-inch square pan (I use a little olive oil). Cut parchment paper to the width of the pan and line the bottom and two sides of the pan, letting the ends overhang. Grease the paper. 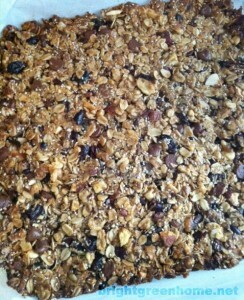 *I have the food processor out anyway to grind up the oats, so I blitz the dried fruit and nuts in there too. Add wet ingredients to dry and mix until evenly coated. Dump into prepared pan and use your fingers to press down into an even layer. Bake at 350F for 35-40 minutes or until the edges are browned–the middle will still be very soft and you’ll think you underbaked it. It took me 2 or 3 tries, first overbaking and then underbaking before I got it really right. Cool in pan on wire rack. After an hour or two you can lift it out of the pan and let it cool on your cutting board or a rack. You want it completely cool before you cut it, and in fact to get really clean edges it’s best to completely cool it, then put it in the fridge for an hour or two to let it firm up even more. (However, my husband prefers to dig it out of the pan while it’s still warm, and I can’t blame him because it’s delicious that way.) Cut with a very sharp knife. They will keep for over a week in the fridge in an airtight container; let them come to room temp or microwave for a few seconds before eating.